In its 5th year now, the attendance annual awards is a much awaited event in the cultural calendar of Bangalore. As its awardees include artistes from outside Bangalore too, its reverberations are felt far and wide and many came from other cities to attend the function on Dec 5, 2015. This year’s awardees included Sheejith Krishna for attendance-Ram Gopal Best Male Artiste title. Due to floods in Tamilnadu, epic-centred in Chennai, the Bangalore-based organizers of the awards had thought he would not be able to come since all trains and planes had ceased to operate during those 5 days of near pralaya! But Sheejith Krishna drove all the way with fellow awardee Dr. Gowri Ramnarayan, who received the attendance-Mohan Khokar Award for Overall Excellence. The spirit and professionalism shown by these two Chennai based artistes showed high commitment to art. The Bangalore-based awardees were sisters Mayuri and Madhuri Upadhaya for attendance-Uday Shankar Award for Choreography. 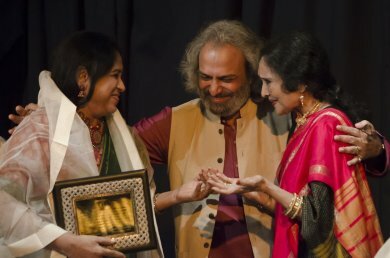 Guru Padmini Ravi received the Rukmini Devi Award for significant contribution to her brand of Bharatanatyam, and Maya Rao Lifetime Achievement Award was bestowed on Guru Radha Shridhar, who has trained scores of first-rate dancers, of whom Aishwaraya Nityanand reigns supreme. She showcased her guru’s art. The award ceremony was serene and elegant. The venue and cultural partner Alliance Francaise de Bangalore was tastefully lit up with X'mas lights. The Bangalore School of Music, under leading light Aruna Sunderlal, contributes majorly and the foyer had welcoming live nadaswaram playing. The attendance awards are the concluding event of the year long Dance Discourses, curated and conducted by Ashish Khokar. In its 7th year now, over 750 dancers have been showcased in this Series and over 30 awarded. 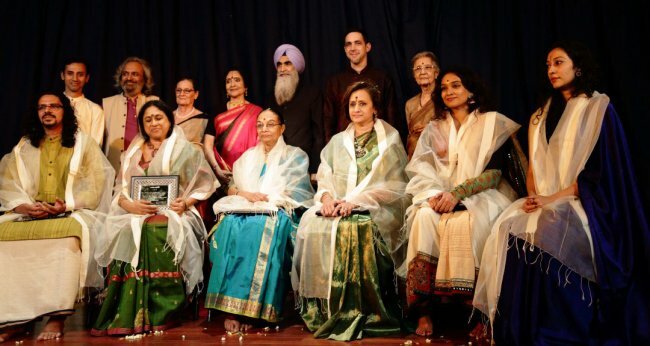 Past awardees include Praveen Kumar, Satyanarayana Raju, Ramli Ibrahim, Anuradha-Shridhar, Syed Sallaudin Pasha, Anita Ratnam, Murali Mohan Kalva, Madhu Nataraj, Rajendra-Nirupama, Avanthi Meduri among others and gurus Bhanumati, Lalitha Srinivasan, Radhakrishnan and Maya Rao. There are no flashy shawls but muted and understated off-white stoles. Each awardee gets a 5 line citation, carefully compiled by Elisabeth Khokar, co-publisher of attendance yearbook and dance mentor. Each awardee gets 15 minutes to perform, were they to so chose, or a short film on their work is shown. 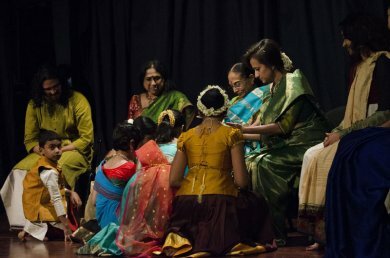 Mayuri and Madhuri Upadhya’s dance company Nritarutya showcased Matysa, a recent work and it wowed all present. Despite limitations of AFB's small stage and basic lights, the group acquitted professionally, Aishwarya Nityanand's Natanam Adinaar, a Shiva Kriti, was done with aplomb. Here is a dancer who brings old-fashioned beauty of the form with high standards and perfection. She was selected by India Today as top of under-30 talent in India last year in a nationwide survey. Both Sheejith Krishna and Gowri Ramnarayan came without film of their work due to floods and time constraints but the same AFB audiences had seen their production Sarpa Sutra a few years ago, on the occasion of attendance awards 2012. Guru Padmini Ravi spoke about her journey and the short dance she did was minimal and informal. She has trained many students of note in Bangalore and organized the Bangalore Habba, a popular mass event for some years. Guru Radha Shridar was the only awardee who made a proper acceptance speech. Some interesting features of the function were pada puja by budding dance students of Sampada Pillai, Tushar - Puja Bhatt and Madhulita Mohapatra. Another feature was young upcoming talents conducted the evening while chief mentor Ashish Khokar stayed in the background. “This is the best way of teaching and mentoring,” he holds. Thus, bright Odissi talent Meghna Das welcomed all and introduced the evening. Kathakaar Tushar Bhatt handled lights and tech room with Aslam of AFB. Dancer Praveen Kumar brought the Nadaswaram party. Nandini Mehta of Nadam brought plants and flowers for awardees. Two patrons Vinay Shinde and A. Narayan hosted the dinner. It was thus a coming together of so many good people who love dance and thus supported this initiative. attendance award function was also graced by iconic superstar Vyjayantimala, who accompanied educationist and art-patron Dr. Vimala Rangachar, who was last year’s awardee. In all, the event was meaningful and memorable.